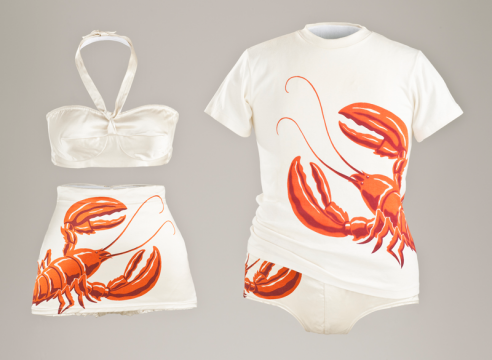 Lobster swimwear by Mary Ann DeWeese for Catalina Sportswear, 1949. 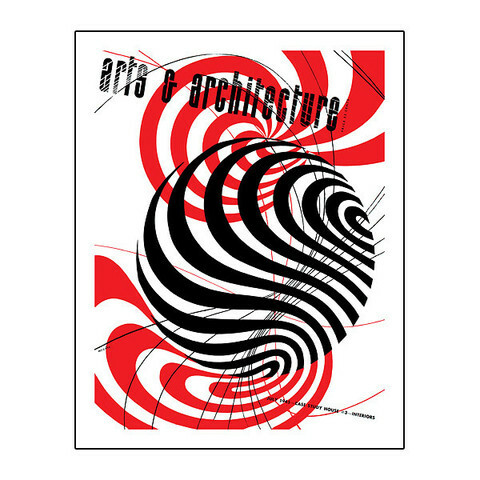 Exhbition poster adapted from a Ray Eames design for the May 1943 cover of Arts & Architecture magazine. 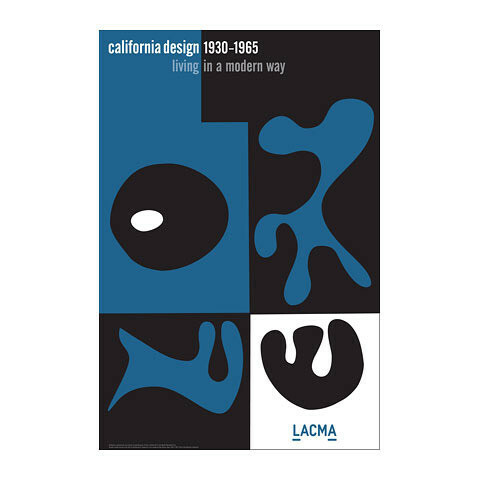 All good things must come to an end, and with the curtain set to drop this Sunday on LACMA’s milestone show “California Design, 1930–1965: “Living in a Modern Way,” we went for a farewell visit Tuesday night. There’s no excuse what with the free admission after 5 p.m. most evenings and a bar al fresco steps away from the entrance of the Resnick Pavillion and Chris Burden’s “Urban Lights” (you know, those 200 antique street lamps facing Wilshire Boulevard that have become a tourist attraction). Billed as the first major study of California midcentury modern design, the show is part of Pacific Standard Time, the sweeping initiative of some sixty cultural institutions across Southern California that began last fall. Most of the programming ended in March, and the closing of LACMA’s survey finally ends this landmark experience. Some 350 objects and ephemera are on view. Sure, you’ve seen some of it before—or something like it given even the casual exposure that can be had these days thanks to shows such as “Mad Men” or fashion designers such as Trina Turk (who was among the lecturers this spring at the museum’s Bing Theater and is a major champion and preservationist, along with her husband Jonathan Skow, of midcentury California design, from their two homes to the many crafts and furnishings filling them). Evenso, it’s worth hitting the show, even a second time, to see the sheer creativity and bold optimism collectively on display. Christopher Hawthorne’s thoughtful review of the show in the Los Angeles Times when it opened last fall flashed back to mind as I meandered from jewelry collection to living room furniture set-up to a wall of iconic photographs. Among the gems on view are the “California Lobster” swimsuits Mary Ann DeWeese designed for Catalina Sportswear in 1949, and on loan by their lucky owner, the marvelous Esther Ginsberg of Golyester Antiques. The show is not only a walk through a sun-flecked memory lane. It’s a revelation of what is going on now in design as well as life.